Good morning. I hope you've had a nice week. I ran a 5K on Saturday along with my husband and son. That was a lot of fun and a great accomplishment for all of us! My body is aching a bit, but it was worth it! My son beat us both but I was happy with my time of 35:00. It was a very hilly course and I hadn't really trained for it, so I thought I did pretty well for myself. As far as reading and blogging go, I didn't actually publish anything last week. I spent my time reading instead. I was doing the very casual Spring into Horror Read-a-Thon hosted by Michelle at Seasons of Reading. 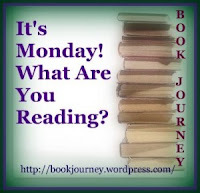 I read my book club's May book, The Madonnas of Leningrad by Debra Dean. Then I picked up Eyes Closed Tight by Peter Leonard. I made it through about half of that one. So I didn't get a ton of reading done, but I find that if I join these read-a-thons, I am motivated to read more often than usual. And that's all that matters! I haven't shared what my kids are reading lately. My son, C, has been reading Minecrafter 2.0 Advanced: The Unofficial Guide to Minecraft & Other Building Games. He's been playing Minecraft since it was still in beta version back in 2011. Some of the things he's doing with it now are amazing. This summer, he'll be attending a week-long camp to learn Java programming by creating a Minecraft mod. Pretty cool! M has been reading Diary of a Wimpy Kid by Jeff Kinney. I'm not totally thrilled with my 7 year old daughter reading this, but she really wanted to, so I let her. She seems to be liking it! Thanks for stopping by! Hope you're having a good week. Wow, I am so impressed that you ran a 5k without training for it and can still move! Bck in my 20's when I was in great shape but hadn't been running in a while, I went on a 2-mile "fun run" with some friends (including my future husband! ), and I could barely get out of my office chair for days afterward! lol Good for you! Good for you with extra reading, too. One of these days I will join a readathon. When things slow down - ha ha. Ok, that was pretty off-topic - enjoy your books this week! C is a future programmer or engineer, definitely. He just loves that stuff! Very cool that you knew the guy who invented Java. I have really mixed feelings about the book. I'm going to try to write up the review tonight. Hope you enjoyed your books. Quite an accomplishment for a busy mom. Take it from me. :) Thanks for joining me again! My boys love the Wimpy Kid books. I think they started reading them around 7. At least, my younger son did. My older son, who is 12 1/2, is reading Cabin Fever now. He still loves them. Yes, C is still reading them all. He's looking forward to the next one coming out in the fall. Thank you! I only run about once a week or less. I usually do other things for working out, mostly workouts on fitnessblender.com. It does seem Wimpy Kid is popular with the young kids. My 10 year old is re-reading them now and I think he's probably getting a lot more of the jokes and things he missed when he was younger!